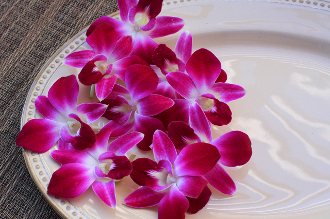 Please note that this Orchid will continue to be offered as "Decorative" only, because we have switched suppliers and they are not "Certified Edible". Vibrant purple-ish pink color with a white center. Gorgeous garnish for fruit/cheese platters and buffet tables. Can also be used to decorate drinks, cakes and entrees! They are about 2" in diameter. Perfect for adding a tropical feel to your Summer parties!